If you love the idea of mixing up chemicals and dream of having your own mad science lab one day, this one is for you. You are going to mix up each solid with each liquid in a chemical matrix. In a university class, one of the first things you learn in chemistry is the difference between physical and chemical changes. An example of a physical change happens when you change the shape of an object, like wadding up a piece of paper. If you light the paper wad on fire, you now have a chemical change. You are rearranging the atoms that used to be the molecules that made up the paper into other molecules, such as carbon monoxide, carbon dioxide, ash, and so forth. 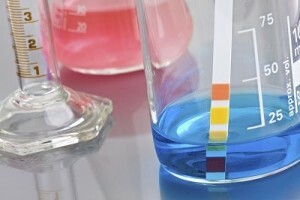 How can you tell if you have a chemical change? If something changes color, gives off light (such as the light sticks used around Halloween), or absorbs heat (gets cold) or produces heat (gets warm), it’s a chemical change. What about physical changes? Some examples of physical changes include tearing cloth, rolling dough, stretching rubber bands, eating a banana, or blowing bubbles. About this experiment: Your solutions will turn red, orange, yellow, green, blue, purple, hot, cold, bubbling, foaming, rock hard, oozy, and slimy, and they’ll crystallize and gel — depending on what you put in and how much! If you stuck with the chemicals we listed here, yes the trash or toilet are safe ways to dispose of them. What is a safe way to dispose of all the end result chemicals? Is it safe to pour in sink or flush down toilet? There’s a video on how to do it on this page – did you find it? You simply cut up a red cabbage, put it in a blender with enough water to cover, blend well, then strain out the solids. The juice is ready to go! Hi, how do you make the red cabbage juice? Yes, you can use different chemicals with this experiment (just stick to the list and delete the ones you don’t have). Can anything be substituted for borax or icemelt? All you do is put the red cabbage chunks into a blender with some water, whirl it around, and strain out the pulp to get the cabbage juice I used in the video. Hope this helps! We did this experiment (from the DVD’s). And my only issue with it is that you had red cabbage juice… and we were told to get a head of red cabbage…. I didn’t see or find what to do with our head of red cabbage. So we just tore chunks and tossed it in the cups, which of course didn’t work. The kids were still thrilled but the colors weren’t there. My kids are having a blast doing this before our camping trip! They are being extremely curious and creative. They’re starting to make predictions before they mix new things. Thank you! Purple (or red) cabbage, when prepared, is purple. That purple color is not an indicator itself that the cabbage solution is neutral. The solution is actually slightly acidic. Preparation of the solution distills out Anthocyanin molecules that will change their color depending upon the pH of the test solutions. This experiment will tell you whether a substance is an acid or base as compared to whatever low acidic level your cabbage juice contains. To get the true pH of the cabbage juice, you’ll need to do a litmus test on it. Something more acidic than cabbage juice will turn pink, and something basic will turn green. Can you please explain. I understand that when purple cabbage is mixed with vinegar it turns pink to show that it is an acid. I thought that purple cabbage with water stays purple and shows that it is neutral and a base will be green. We did this experiment not once but twice in the last week and our boys had a lot of fun. We invited a few friends over to help mixing, stirring and observing. Like the comment above, our mixture with hydrogen perioxide faded, not right away but within a few minutes. We even tried to pour in more cabbage juice, nice and dark, and then a few minutes later, almost clear with a tint of pink…. After we did all the combinations, the kids made their own mixtures – a lot of fun and we now have some strange looking substances in our garage… some of these combinations created solids that when drained through coffee filter turned malleable, our son rolled some into a ball and the next day it was dry, hard and fun to play with! Thank you for yet another great experiment. Solids exist as either a crystal (a solid whose atoms are arranged in a specific shape) or as an amorphous solid (matter that has solidified without a specific or shape). Metals are amorphous solids and can easily be observed solidifying from their liquid, molten state. Metals conform to the shape of whatever container they cool in. Crystals are solids as well, but they form differently. Crystals form into a specific, identifiable shape, paying no attention to the space they are growing in, whether they are quartz crystals or salt crystals. Crystals can be formed in different sizes, but each crystal will look the same. So, crystalline solids form into specific shapes and amorphous solids form into whatever the shape of the container they are cooling in. When atoms arrange in a certain pattern crystals are formed; that’s how all solids form. How can we explain to a student the difference between the formation of a crystal and a solid or the difference between a crystal and a solid. We can form crystals from any soluble solid. Insoluble solid we can’t call a crystal. How can it be explained? add vinegar in. Thanks, Aurora. Sodium carbonate, Na2CO3, releases more heat when dissolved in water. It’s called the heat of solution. It is an exothermic reaction so the products (the hydrated ions) have a lower energy content than the initial compound, resulting in the release of energy in the form of heat to the water. Sodium bicarbonate, NaHCO3, releases less heat than the above carbonate. Many polyatomic ions are given the name prefix “bi” when attached to a polyatomic ion (an ion with more than one atom). The red cabbage extract indicates not only whether your substance was an acid (vinegar) or a base (ammonia) but also how strong of an acid or base it is. Although this will vary a bit with cabbage, the colors and approximate pH values are red (pH=2), purple (pH=4), violet (pH=6), blue (pH=8), blue-green (pH=10), green (pH=12). When you get a pH value below 7, this means that your substance is acidic. The smaller the number, the more acidic it is. A pH value higher than 7 means that a substance is basic, and the larger the number, the more basic it is. Does that help? We just finished the chemical matrix. What does all the green color indicate? Some pH strips don’t change as dramatically as others, depending on what kind you’re using and what you’re testing. You can make your own pH strips using the cabbage juice and paper coffee filters – just dip in the juice and let dry. Instant pH strips! We used ph strips and were a bit disappointed– didn’t change colors as much as the cabbage juice would so we are going to try with the juice next time. Anthocyanins are water-soluble dyes that change color with pH, and can be found in plant leaves, stems, and flowers. When you add anthocyanins to hydrogen peroxide, the peroxide starts to decompose the anythocyanin. Depending on the strength of the two, this will happen faster or slower. You can use sour cherry juice, strawberry juice, or pomegranate juice as indicators in place of the red cabbage juice, as these hold up a lot better to the H2O2. The reason we have you test hydrogen peroxide (and rubbing alcohol) is that they don’t change as most people expect them to… which is great for honing your observation skills! Just the ones in the peroxide, everything else had beautiful colors! Hmmm… sounds like you did the experiment right, but just found different results than we showed in the video. Science is like that sometimes! I noticed in the photo that you have colors in the cups. Did all the colors fade after a few minutes after snapping the photo, or just the ones with the H2O2 in it? For liquids we used water, soap, vinegar, alcohol and hydrogen peroxide. The cabbage juice was deep dark purple, almost to the point of black. All of the other liquids held their color and we had a beautiful rainbow display. I e-mailed a pic to you. If you look at the front row, you with notice all of the cups are clear. That is the peroxide row. The solids were calcium chloride, sodium bicarb, sodium carb, ammonium nitrate and citric acid. We didn’t dilute anything except the soap solution which we added distilled water to. What was the original color of your cabbage juice before you added it? Sometimes if your water used in the cabbage juice is already acidic and you add it to a base, it’ll cancel out and turn to a neutral pH color (NOT clear, though!). Also, the more diluted your cabbage juice is, the less color you’ll see when added to your other solutions. You can test it out by adding it to ammonia (which will turn it green/blue) or to distilled white vinegar (which turns it pink). The color should stick around for at least a half hour, maybe having a color change near the end. Tell me more about what you added your cabbage juice to… was it diluted as well? My 7 year old son did this experiment today for our homeschool group. When we put the cabbage juice in the hydrogen peroxide the color faded after a few minutes. We tried adding more with the same result. We are wondering why? Does the peroxide neutralize the anthcyanin or is there something else at work? None of the sample cups held color either. They all reverted to clear or white within a few minutes. Oops – that was a typo. You’ll find the shopping list ABOVE, not below that text. Sorry about that! Where would I find: “Secretly get an identical second set of chemicals from the grocery store (shopping list follows) ….aka the shopping list? Thanks!